Our custom roll tickets are available in a wide variety of sizes, styles, and colors. 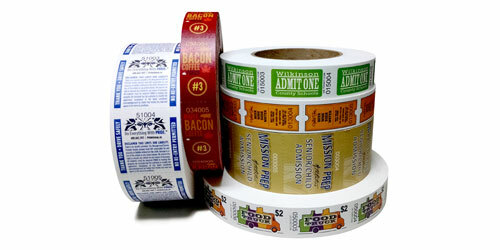 Adding your own text and logos to our roll tickets is a great way to promote your business, organization, or sponsorship, all while keeping close tabs on admission or profits. We offer quick turnaround and top notch service with every custom roll and raffle ticket job. Our custom roll tickets come in two different styles: Bristol and Full Color. Custom bristol roll tickets are printed in black ink on mediuim weight, colored bristol stock. Each roll is pre-numbered and sequential to allow faster production times. All custom bristol roll ticket artwork sent to us is converted over to black and then printed directly onto the rolls. Bristol stock is available in 5 different sizes. Standard tickets measure 1x2" and are numbered on both ends. Redemption tickets are slightly larger at 1.1875x2" but are numbered on only one end. Coupon tickets are perforated down the middle to make a two part ticket with two sets of matching numbers on one end. Billboard tickets are a square 2x2" ticket with more room for artwork or logos with a serial number at the top. Marquee tickets are two billboard tickets attached side by side with matching serial numbers at the top. Click on a template to download a pdf document you can edit in Adobe Illustrator. Our full color roll tickets are printed on bright white 8pt stock and numbered however you would like them to be. Our printing and production process allows you a high degree of freedom in choosing the exact look you would like for your roll tickets. Full bleed artwork, backside printing, advertisements, custom sizes, the list goes on and on. Give our sales representatives a call to discuss how we can create the perfect ticket for your event today!